Bilge Alarm, or Oil Content Meter, for ship bunk use, marine applications, monitoring the oil content in bunk water before discharging to the sea or river, a must for enviornmental protection for all ships. We are glad to announce the release of model GQS-206 15ppm bilge alarm / oil content meter designed according to the IMP Resolution MEPC.107(49), a major and completely new release since the successful and famous model GQS-186 of the 1990's. The new bilge alarm features seperate structure with independant control chamber and detection chamber, with unique 5-beam light path structure to ensure accuracy and steability, strong automatic alarming capabilities completely in compliance with IMP Resolution MEPC.107(49), easy installation and operation. 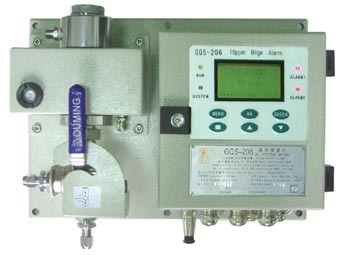 The display unit is large size LCD ( liquid crystal display panel ), the latest display unit, therfore with built-in micro computer, the interface for GQS-206 is more intuitive and user-friendly, and offers much more information from the display panel compared to conventional models using LED display. Using built-in micro-computer, the data processing and searching functions are much stronger too. Protection grade of IP65 makes it more safe. This equipment is a must for all ships sailing in international waters since 2006 for the sake of enviornment protection. 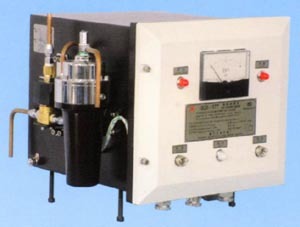 Sample Flow Rate 0.1-4 L/min. Availability: we usually have ready stock for small orders. For bigger orders please contact us. For User's Manual in English language, please download here. You'll need Acrobat Reader to view it. For more information please contact us directly. 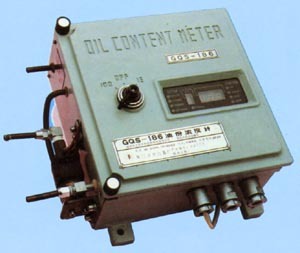 Below is older models of our Bilge Alarm / Oil Content Meter, monitoring equipment used to continuously detecting the oil content in water, suitable for enviornmental protection, petro-chemical industry, port, ship's water discharge monitoring. 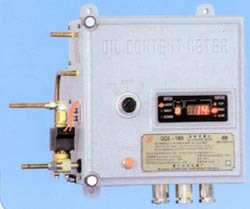 The product is in compliance with standards of MEPC60(33), and are still in use in some occassions. Not influnced by particles in suspension in water, oil types, water colors. Sample require no regent treatment.